Have you heard about the craze surrounding the ketogenic diet? That’s because the proof is in the pudding; for those who stick to the strict keto diet protocol, weight loss becomes attainable rather quickly. The “quickly” part appeals to most, and encourages an almost extreme shift in dietary habits as those seeking weight loss chase the keto-zone. The appeal of the keto diet is the promise to lose weight quickly. A ketogenic diet is very low in carbohydrates and very high in fat content. Typically, 65-75% of your energy comes from fat, 15-20% from protein, and less than 5% from carbs. After ~3 days of a low carbohydrate keto diet (say <20g/day for those who track their macronutrient intake), your body will be in a carbohydrate-deficient state. Your brain and central nervous system which depend on carbohydrates, will require a different source of energy to function. This is where body fat and ketone bodies come into play. Your liver can convert body fat into ketone bodies, and use them as an alternate source of energy. This is why a ketogenic diet is linked with weight loss success stories. Essentially, you are starving yourself of carbohydrates, and your body compensates by accelerating fat burning. The goal of the keto diet is to limit carbs so that you enter the “ketosis” state, where ketones are your main fuel. It’s all about the ketones! The keto diet’s goal is to get your body to use ketones as the fuel. Ketones can be used for energy by different organs and tissues. This includes your heart, kidneys, and even muscles. What’s remarkable is that unlike fat, ketones can provide energy for your brain since they pass through the “blood-brain-barrier.” The blood-brain-barrier is a protective filtering system in the vessels that carry blood to the brain and spinal cord, allowing only certain substances to enter. You can think of ketones as a reserve energy source that has evolved in times of starvation, since your body can rely on its stored fat. Keto diet = ketones as your energy source. What does a keto diet look like on your plate? Needless to say that it makes eating a bit more complicated! And by limiting your food choices, you typically limit your food intake… That is why people tend to lose weight. The thing is that a keto diet can lead to nutrient deficiencies as some many food groups are eliminated from the daily diet. You miss out on vitamins, minerals, antioxidants, and fibers (on top of constipation that is normal during pregnancy! ), all of which are important for baby and mama during pregnancy. Nutrition knowledge is essential to adopt a healthy and balanced keto diet. Pregnancy brings a miraculous transformation in women’s bodies, one that is accompanied by weight gain. That is a delicate subject. Don’t gain too much! Gain enough! Not too fast! Lose weight before pregnancy! Not during! Weight management during pregnancy IS a tricky subject. Clearly there is a lot of pressure for women to “control” their weight. Not surprisingly then that it may be tempting for some to try a trendy new diet like the keto diet. 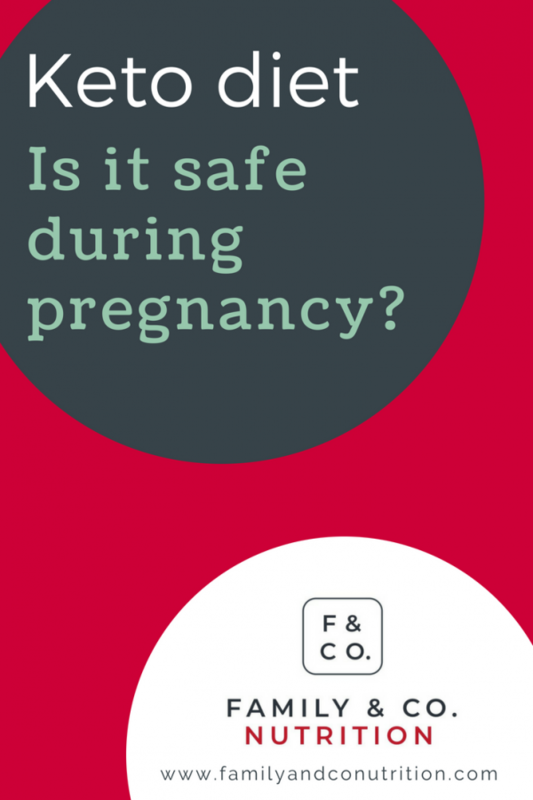 But, the important question to consider is whether this is safe for you and your baby’s development during pregnancy. Managing your weight (during pregnancy or not) is not easy and comes with a lot of pressure. Should you lose or store fat during pregnancy? Early on in pregnancy, mama’s body gears up to store fat…not burn it! Right away you can see how a ketogenic diet is conflicting. The placenta releases hormones like lactogen, prolactin, and progesterone which not only stimulate appetite, but favors the storage of fat. Whereas, in the second half of pregnancy, the placenta helps drive hormonal changes that favor the use of stored fat. Specifically, the growing fetus uses carbohydrates, so mama relies on stored fat for energy. Pregnancy is not the time to lose fat, the evidence are clear on that one. Pregnancy is naturally driving mothers to store fat, to ensure adequate growth of your baby, healthy pregnancy and delivery, and successful lactation. Is your keto diet impacting your growing baby? Studies have shown that ketones can freely cross the placenta and be used by baby for energy. If that’s the case why is a ketogenic diet during pregnancy controversial? Because there is a difference between ketosis for 8 hours vs ketosis for months! Mama’s body is smart. Under normal dietary conditions, it can juggle sources of energy quite well. Sleeping for 8 hours at night is essentially like fasting. During that time, you are not consuming carbs, fats, and protein…because you are asleep! Your body still must function, so it uses fat stores for energy both directly, and to produce ketones to compensate for the lack of carbs. This is different than starving your body of carbohydrates intentionally for days on end, and attaining a ketosis state for months. To date, we don’t know the short and long term impacts of a maternal keto diet during pregnancy on the health of the mom and the baby. There is a difference between naturally occurring ketosis due to a good night sleep, and self-imposed ketosis due to dietary restriction. We don’t know if it is safe. Can a keto diet harm baby’s development? Observational and experimental studies have shown that ketones passes the placenta, and are used by the growing brain of the fetus, impacting its functions. It remains unclear as to what are the short and long term effects of ketosis, and if there is a dose-response seen with the concentration of ketones in the mother’s blood. A study in pregnant mice fed a ketogenic diet found that fetal growth rate was significantly higher during the first half of pregnancy, but was substantially inhibited later in pregnancy, compared to mice fed a standard diet. What can possibly explain this? Upon further investigation, it was found that in the later stages of pregnancy, the placenta increases the number of carbohydrate transporters to ensure the fetus gets enough glucose for its growth-related needs. The underlying assumption is that there is plenty of carbohydrates available, its availability to the growing fetus is limited by how much the placenta can transfer. Since a ketogenic diet is low in carbohydrates, the increase in placental carbohydrate transporters doesn’t do much because there simply isn’t enough glucose available. The result? Growth abnormalities, including reduction of brain areas like the cerebral cortex volume, hippocampus, and corpus callosum. Of course, a baby mouse is different than a human baby, but that is something to keep in mind and the best we can do ethically to study the impact of keto diet on baby’s development. A study that followed 223 pregnant women with pre-gestational diabetes and/or gestational diabetes looked for a possible link between maternal ketone levels and mental development in children. Diabetes is a disease known to potentially increase the ketones level in the blood when it is not managed properly. 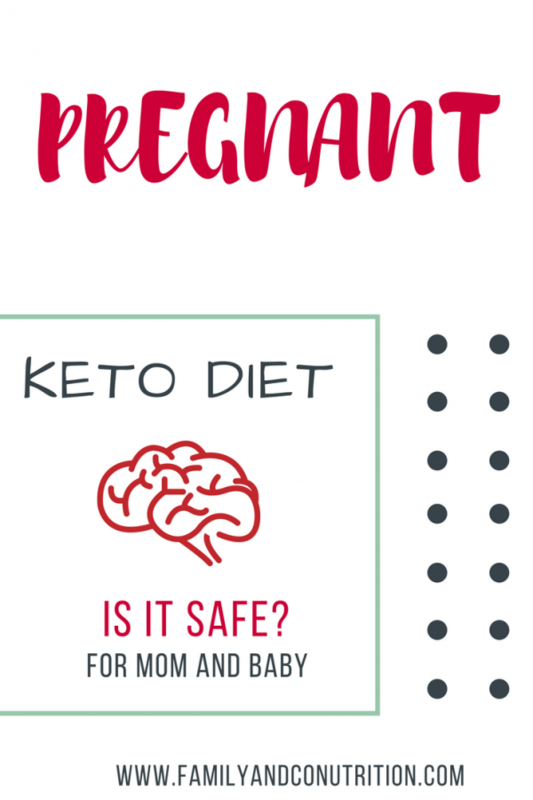 It is to note that the circulating concentration of ketones in maternal blood would likely be higher if resulting from gestational diabetes than the concentration achieved by following a keto diet. In that study, intelligence quotient (IQ) was measured at ages 2 and again between ages 3 to 5. 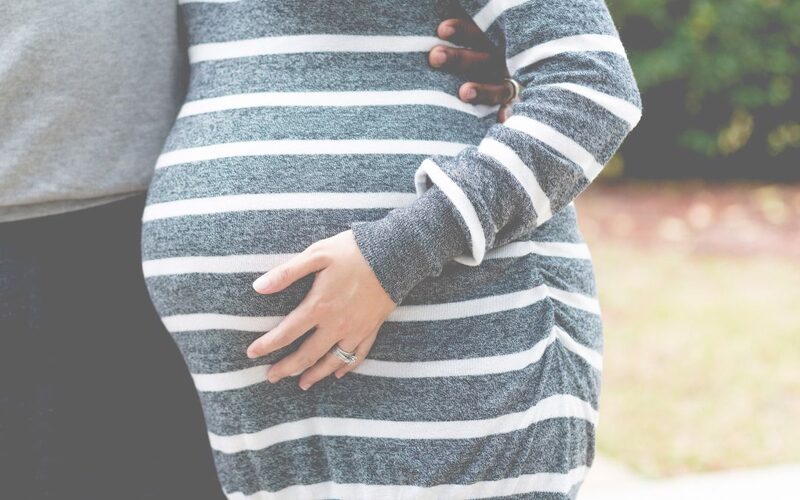 The researchers found that the IQ was lower in children whose mothers had higher ketones and fat levels during pregnancy, suggesting a negative impact of circulating ketones in the mom’s blood. 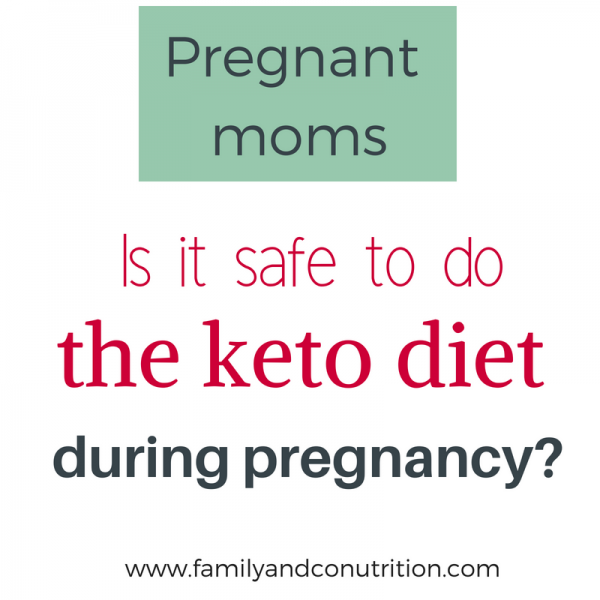 It is not possible for women following a keto diet to know what are their ketones concentration in their blood, and to alter their diet to ensure a “safe” ketosis is maintain at all time during pregnancy. 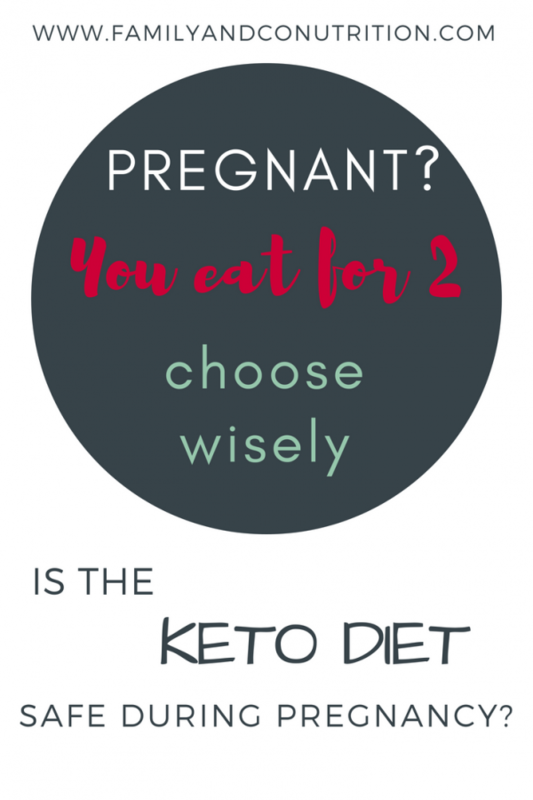 Adopting a keto diet to lose weight during pregnancy doesn’t seem like a good idea. Weight loss is not recommended during pregnancy. A mother should and need to gain weight, one of the signs that baby is growing well. Mothers who don’t gain enough weight during pregnancy tend to have small-for-gestational-age babies, and to deliver prematurely. Both small-for-gestational-age babies and premature babies can be associated with health problems including neurologic development issues. A lot is unknown (and unethical to test!) 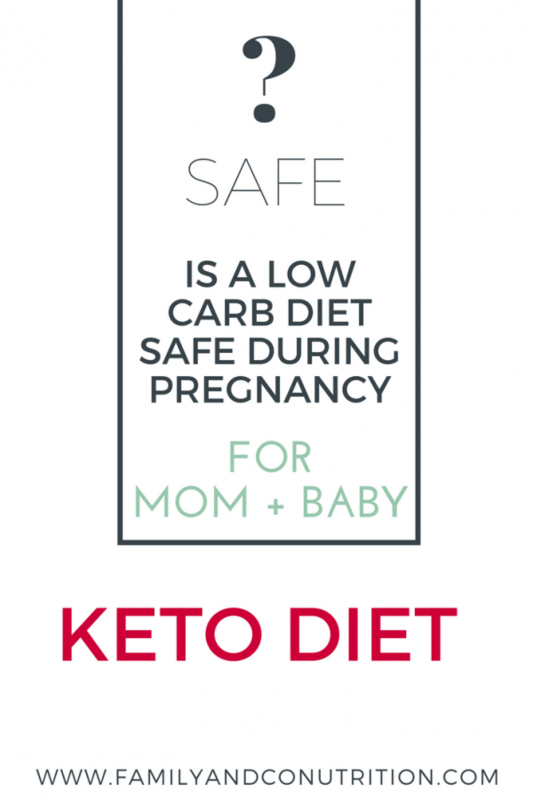 about ketosis, pregnancy and the safety for mom and baby. 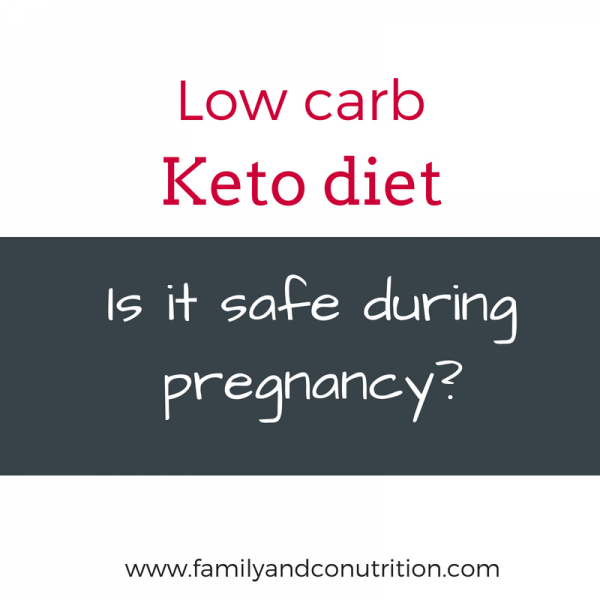 Is a low carb keto diet safe during pregnancy? We don’t know the full story about the long term risks for mom and baby, but we know that it requires to cut out a lot of healthy foods from mom’s diet. 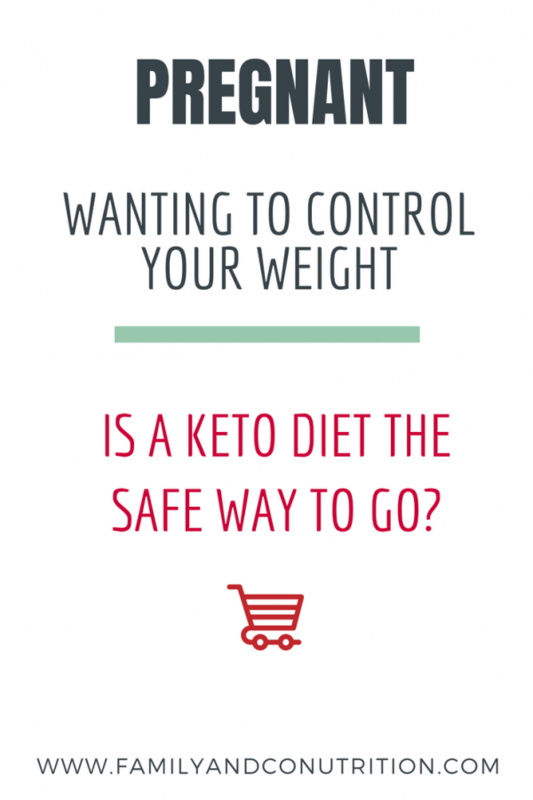 The key question is: why do you want to adopt the keto diet? We are all for reaching your natural weight and aiming for an adequate weight gain during pregnancy. There are better ways to manage your weight and pregnancy weight gain. We are all for adopting healthy lifestyle, including better nutrition for you and your family. Adopting such a rigid diet might not be the healthiest way to a pleasant and healthy life. We know that pregnancy is a wild card and that you will lose (totally) control: the baby is now the one in charge. That can be scary. Reframing what you can control and where you should put your efforts might lead to more satisfying results. A credible health care practitionner can guide you when you want to adopt healthy habits for life. For you, and the newest member of your family! Rasmussen KM, Abrams B, Bodnar LM, Butte NF, Catalano PM, Siega-Riz AM. Recommendations for weight gain during pregnancy in the context of the obesity epidemic. Obstetrics and gynecology. 2010 Nov;116(5):1191. Bronisz A, Ozorowski M, Hagner-Derengowska M. Pregnancy Ketonemia and Development of the Fetal Central Nervous System. International Journal of Endocrinology. 2018. Kapadia MZ, Park CK, Beyene J, Giglia L, Maxwell C, McDonald SD. Weight loss instead of weight gain within the guidelines in obese women during pregnancy: a systematic review and meta-analyses of maternal and infant outcomes. PloS one. 2015 Jul 21;10(7):e0132650. Azar ST, Beydoun HM, Albadri MR. Benefits of ketogenic diet for management of type two diabetes: a review. J Obes Eat Disord. 2016;2(2). Rizzo, T., Metzger, B. E., Burns, W. J., & Burns, K. (1991). Correlations between antepartum maternal metabolism and intelligence of offspring. New England Journal of Medicine, 325(13), 911-916. Loose stool: can the BRAT diet help my toddler with diarrhea? Nutritious meals, rather than the restrictive BRAT diet and a lot of fluid (water or milk) will help your child recover from diarrhea. Thank you for your comment Necklie. I really like your suggestion to shop the peripheral aisles of the grocery store – to buy fresh whole ingredients and as little processed food as possible. 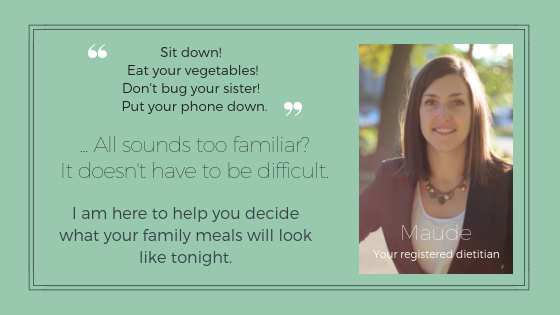 Cooking and eating as a family is always a good strategy, and much easier to do than following any diet!